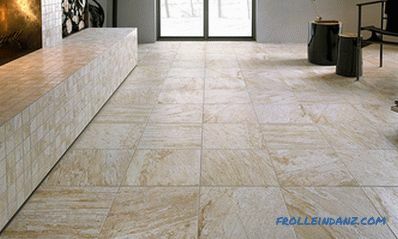 Porcelain tile (gres porcellanato) is one of the types of facing ceramics. Like any ceramics, it is produced by sintering the mixture, where the main components are clay, quartz sand and feldspar. However, there are differences in the technology of its production, which, although they are not of a fundamental nature, gave rise to the colossal difference of porcelain stoneware from ordinary ceramic tiles, which gives grounds to consider it a completely special material. Consider these differences and, perhaps, dispel some misconceptions and myths associated with tile gres. 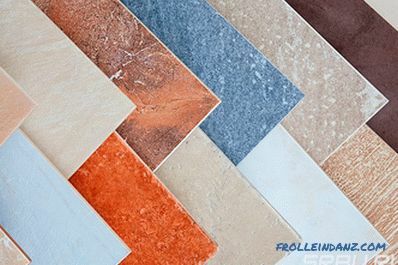 Before discussing the difference between ceramic and porcelain tiles from ceramic tiles, you should familiarize yourself with the features of the production of these materials. If necessary, before firing, icing is applied to the surface of the "biscuit". Glaze can be applied after the main firing, in which case the product is fired again. When applying a complex multi-layered decor, multiple annealing is required, necessary for the formation of glaze. The differences in porcelain stoneware begin with the composition of the raw materials. For ordinary ceramics, red and white clays are used, and for porcelain stoneware - white-burning kaolin and illite. Pore-forming additives, which reduce the mass of products, are introduced into ordinary ceramics. In the case of porcelain, they are not added, which contributes to a dense shard. 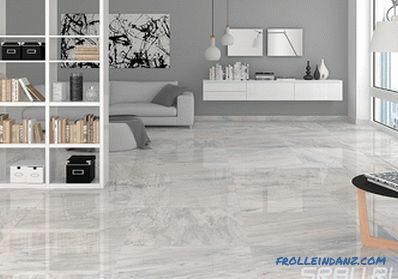 An important role in the mixture for porcelain tile is played by surface-active substances (surfactants), which reduce internal friction in the charge and facilitate its compaction during the molding of products. Porcelain stoneware has nothing to do with natural granite. This name was used by the company Mirage, which first presented this material in the Russian market. 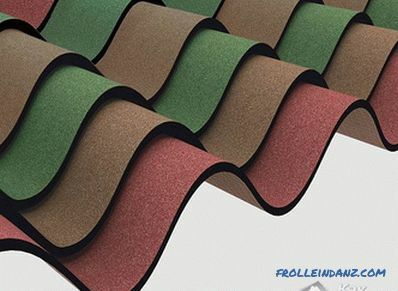 The name stuck because of its durability and characteristic granular pattern, which was on the first series of products. 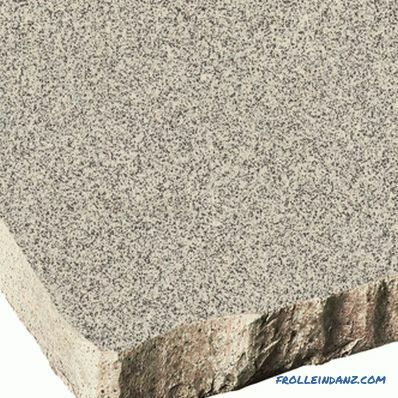 The method of dry and semi-dry pressing is used to form ceramic-granite products. The main difference is high pressure, reaching 500 kg / cm 2 . For other types of ceramics, the pressing pressure usually does not exceed 400 kg / cm 2 . With such a pressure, not only the charge is compacted, but also the deformation of the particles that make it up, destruction, "pressing" them into the total volume and eliminating voids. The pressing process is divided into two stages. At the first, the mixture is pre-compacted. The subsequent pressure release allows you to remove the air squeezed out of the charge, and the second pressing stage completes the process and creates a biscuit, which retains its shape due to surface tension forces and a large grain contact surface. Drying is an obligatory stage, because excess moisture during strong heating violates the integrity of the crock. Firing tile gres has a high temperature. Ordinary ceramics are fired at 950-1180 0 C. The sintering temperature of ceramic granite reaches 1250-1300 0 C.
1. 200 0 C - evaporation of residual moisture. 2. 300-400 0 С - organic burning. 3. 500 0 C and above - dehydration of kaolinite and other minerals contained in clay. 4. 700-800 0 С - afterburning of coke residue. 5. 830-850 0 C - decomposition of clay materials into oxides with the formation of silica and alumina. 6. 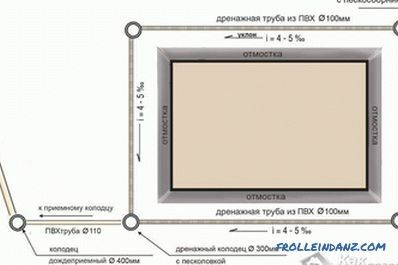 920-980 0 C - the beginning of the formation of mullite, which increases at 1100-12000С. Mullite is a mineral that, together with quartz, provides the hardness of porcelain stoneware. 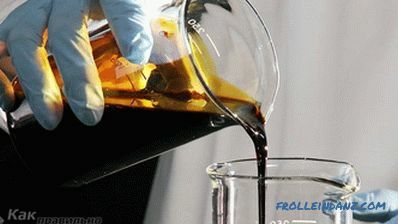 In addition to chemical reactions, a whole complex of physical transformations takes place - the melting of some components and the dissolution of others into them, the formation and removal of the gas phase, the crystallization of new compounds. These processes continue during the cooling of the product, which is no less important than heating, and occurs with maintaining a strict schedule. So, the manufacturing technology of porcelain stoneware is distinguished by the selection of raw materials, high pressure during molding and high firing temperature. Next we consider the differences of the finished material, which are determined by the characteristics of production. High-pressure pressing, the characteristics of raw materials and firing impart high density to the ceramic granite plate.The shard has practically no pores, and the volumetric weight of the material is about 2400 - 2600 kg / m 3 . For comparison: the density of most types of tile is 1600 - 2000 kg / m 3 . Density says little about the consumer qualities of the material. More informative is the ability of products to absorb water. This property characterizes the structural density of ceramics. Closely related to it are the most important operational parameters of the lining - strength, wear resistance, frost resistance. The water absorption of porcelain stoneware does not exceed 0.5% by mass. Some manufacturers declare this parameter at the level of 0.1%, while for the most dense samples it reaches 0.05%. Most types of ceramic tiles have a water absorption in the range of 3–10%. Low porosity gives quality that is important for finishing, especially for flooring. It is stain resistant. Most household and not only household pollutants are easily removed from the surface of porcelain stoneware with a stream of warm water. According to GOST 6787-2001, ceramic floor tiles should have a bending strength of at least 25 MPa. For wall cladding, the requirement is significantly lower - 15 MPa. Strength at a bend of porcelain tile - 40-49 MPa. 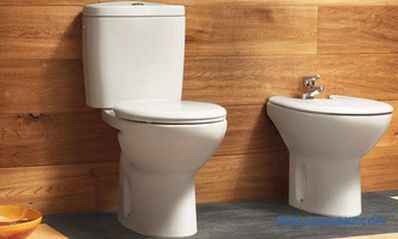 In practice, this means that the GRES tile can not be afraid to break by accidentally pressing while working with it. As a rule, these products remain intact, even if inadvertently stepping on a plate that was not left in place. The usual tile at the same time, most likely, will crack. Impact strength is not standardized by the technical conditions of tile production, therefore it is difficult to make a correct numerical comparison with this parameter. But from practice it is known that the tile gres remains intact in situations where the tile is guaranteed to be broken. Impact resistance is especially valuable for flooring. Ceramics are commonly measured in points on the Mohs scale. This scale is based on ten minerals selected as standards. Talc and graphite have one point on this scale. Ten is a diamond. Porcelain tile on this scale is located on the same level with quartz - seven points. It can not be scratched with a knife, glass, file. Quartz can hardly leave a mark on it. 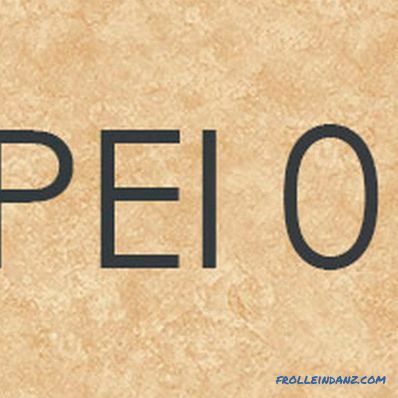 The strongest samples of porcelain stoneware reach topaz hardness - eight points. The ordinary Mohs pottery scores 4-6 points. According to GOST, the hardness of the facing tile is not standardized at all, it only has a requirement for a glazed surface - not less than 5 points according to Mohs. Resistance of materials to abrasive wear is characterized by abrasion. Abrasion is determined by testing the sample with an abrasive tool under strictly defined conditions. The numerical value of abrasion is equal to the decrease in sample mass after the test cycle. In practice, the division of tiles into classes according to its applicability depending on the load is used to indicate wear resistance. PEI-0 - minimum durability. Tiles of this class are applicable only for wall cladding. 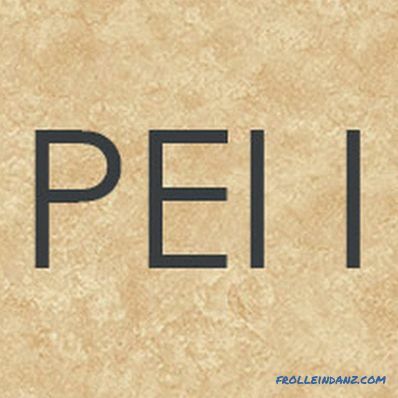 PEI-I - products of this class can be used for the walls and floor of the bathroom, bedroom and other rooms where it happens few people in soft shoes or barefoot. 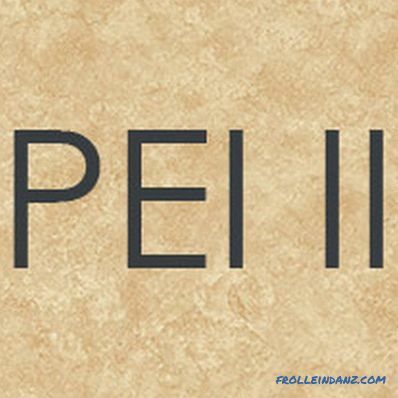 PEI-II is a lining applicable for the floor of residential premises, except for the kitchen and hallway. 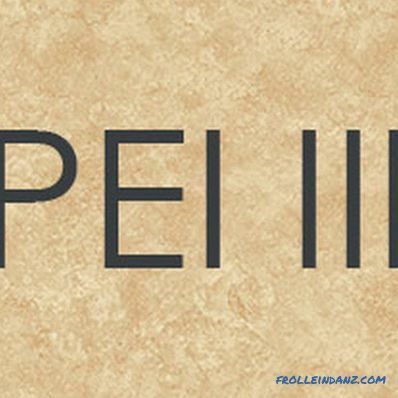 PEI-III is a durable lining that can be used for any premises that do not have direct exit to the street. Applicable for small offices. 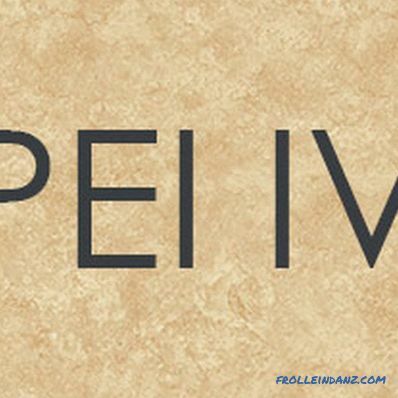 PEI-IV is a tile that can be used to cover the floors of residential premises, kitchens, hallways, and terraces. 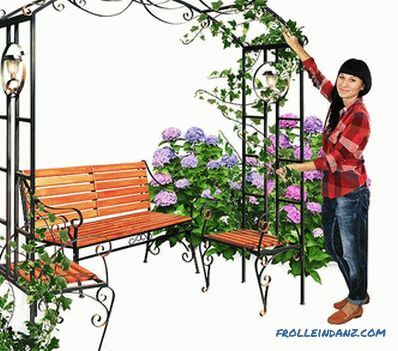 It will withstand the load on the floor of an office, hotel or small shop. PEI-V - cladding for floors of public premises with high intensity of use: railway stations and airports, large stores and entertainment centers . The wear resistance of most ceramic plates is mainly determined by the hardness of the glaze covering them, this is the maximum grade of PE-IV. 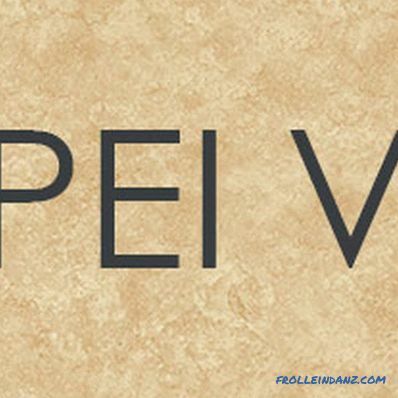 Unglazed stoneware belongs to the class of PE-V and can withstand any load. 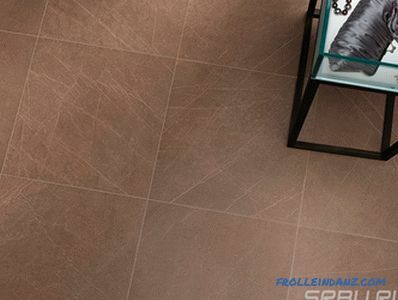 Increased impact resistance, hardness and wear resistance - this is the main thing that distinguishes porcelain stoneware from ordinary floor tiles. These are qualities that significantly expand the scope of ceramic cladding. Frost resistance is the ability of materials to withstand multiple changes in temperature from "-" to "+" Celsius. This property is important for exterior cladding - a terrace, balcony, porch, basement or facade of a building. Freezing followed by thawing results in frosty destruction of the products.The destructive factor is the water contained in the pores and capillaries of the material. When freezing, it expands and creates breaking loads. According to GOST 27180-2001, the frost resistance test is performed by repeatedly cooling a sample saturated with water to -15. .-20 0 C, followed by heating in warm water up to +15. . + 20 0 C. Conventional ceramic plates withstand 25-125 cycles (F25 - F125), gres plates have frost resistance F100 - F300 (up to 300 cycles). Porcelain stoneware can be used without any restrictions for lining any surfaces exposed to moisture and low temperature. 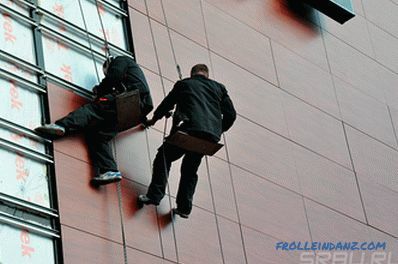 One of the most frequent applications is the curtain wall systems of buildings. The reason for the high frost resistance of porcelain stoneware is its low water absorption: there are very few pores, water is not absorbed, there is no frost damage. When decorating ceramic cladding, there is another difference between porcelain stoneware and ceramic tile. Glazing ordinary tile creates on its surface the hardest, durable and moisture-proof layer. The performance of the cladding increases. Covering tiles with glaze provides tremendous opportunities for the realization of a variety of design solutions. For porcelain stoneware, such decor means lowering all parameters except aesthetics! This material is stronger, harder and more resistant to wear than frosting. 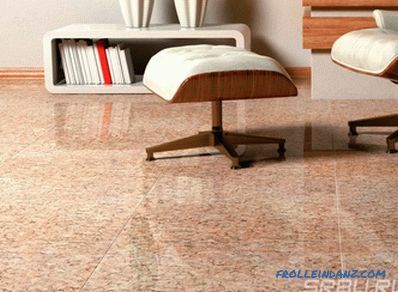 Therefore, glazed porcelain tile is used a little for public spaces, and only for low load cases. Now more about each of the methods. Mineral dyes do not fade, do not fade, always preserve the specified tone. Tile, painted in mass, retains its color at any wear. Two-layer backfill of the charge is a technique that expands the possibilities of decorating porcelain stoneware. First, the main body of the tile is formed, then a mixture containing pigments is laid on it. Laying the decorative layer can be done with the formation of color patterns. After firing, a shard is obtained that is uniform in its physical properties, but having a decorative layer about 3 mm thick. Given the durability of porcelain, this decor can be considered almost eternal, not subject to wear. 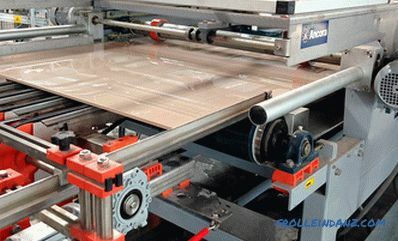 Relief on the surface of the plates is created when they are molded, due to the special shape of the pressing mandrel. This creates an invoice that imitates a mosaic, a structure of a wild stone, wood. The choice of possible textures is not limited. You can create any patterns or effects, for example, the effect of droplets on glass, which will be enhanced by subsequent polishing. The porcelain stoneware immediately after firing has a matte, rough surface. Polishing allows you to give it any degree of purity, up to the mirror. 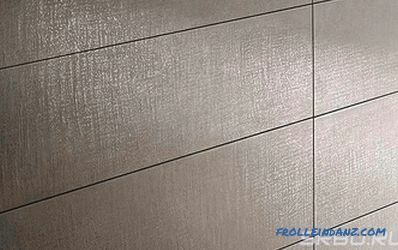 Mirror cladding is less resistant to wear, because abrasive processing violates the surface structure of the material, and any scratches on a smooth surface are more noticeable. This is what partial polishing is called. Initially, products intended for lappatirovaniya, have a slightly uneven surface. Polishing with a flat tool reveals these irregularities, turns the protrusions into mirror sections, without affecting the depressions. Height difference is measured in microns, but this is enough to create a fascinating pattern of glossy and matte spots on the tile. This is getting a smooth, but not mirror-like surface by treating the plates before firing with special compounds. Satin tile has a soft "satin" gloss, smooth to the touch, but not slippery. To compile a comparison table, data of the technical characteristics of porcelain stoneware and ceramic tile of various manufacturers were used. 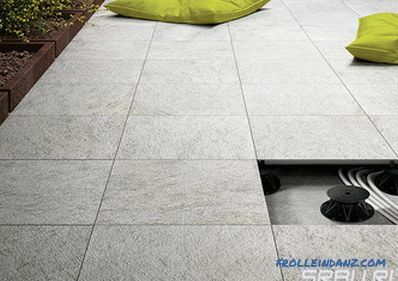 Porcelain stoneware exceeds ordinary ceramics in all its physical and technical parameters. By decorative possibilities, these materials are approximately equal. When choosing a coating, you should take into account the higher cost of porcelain stoneware and the fact that its use requires a special tile adhesive, which is about three times more expensive than tile adhesives.